NASAengineers are replacing fuel line seals on the space shuttle Discovery to stauncha small leak in time for the spacecraft's final blastoff on Nov. 1. Shuttletechnicians are replacing two suspect seals in a fuel line for the twin orbitalmaneuvering system engines near Discovery's tail. The repairs should becomplete by Monday (Oct. 25), just one week before Discovery is due to launchon its last spaceflight from a seaside pad at NASA's Kennedy Space Center inCape Canaveral, Fla.
?Theminor shuttle fuel leak was found in a rearcompartment on the shuttle where two propellant lines converge to feed the vehicle'saft-mounted engines. "Replacingthe seals allows NASA managers to have the highest confidence in the system andwill allow the seals and flange to be inspected," NASA officials said inan update. Toreplace the seals and flange, engineers must first remove the monomethyl hydrazinepropellant used in Discovery's orbital maneuvering system engines from nearbytanks. Those tanks will have to be topped off again once the work is complete. Astronautsuse the two orbital maneuvering system engines on Discovery to make major courseadjustments in orbit, as well as to begin the descent maneuver to leave orbitand return to Earth, NASA officials have said. Theengines are mounted at Discovery's rear, one on either side of the shuttle'stail. They are above the space shuttle's three main engines, which are usedduring launch. If allgoes well, the repairs should be completed in plenty of time "to still support Discovery'stargeted Nov. 1 launch date," NASA officials said. Discovery is poised to launch on an 11-day mission todeliver a storage room and humanoid robot to the InternationalSpace Station. The mission will be the 39th and last spacevoyage for Discovery ? NASA's oldest shuttle ? and is one of the two missionsscheduled before NASA retires its shuttle fleet next year. 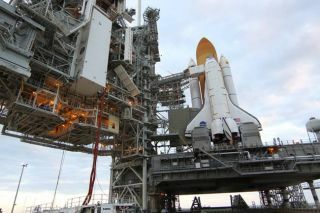 The shuttle Endeavour will follow Discovery's finalflight with one last mission of its own in early 2011. A third, extrashuttle mission has been approved by Congress and PresidentObama, and is due to be reviewed by congressional appropriators later thisyear. Top NASA shuttle program managers plan to meet Monday fora standard preflight meeting to decide whether Discovery is ready for launch. The shuttle is currently slated to launch Nov. 1 at 4:40p.m. EDT (1940 GMT). Two spacewalks are planned during the flight. The missionwill be NASA's 133rd shuttle flight since the orbiter fleet began flying inApril 1981.